Before sexual-misconduct allegations transformed Brett Kavanaugh’s confirmation hearings into a nationally televised spectacle, Democrats focused on the Supreme Court nominee’s expansive view of presidential power. His single most controversial article suggested that sitting presidents should be immune from civil lawsuits, criminal investigation, or prosecution. Before taking his seat on the highest court, Kavanaugh spent about a decade as a judge on the U.S. Court of Appeals for the D.C. Circuit, often called “the little Supreme Court” because it handles crucial cases related to federal agencies and because many of its members get elevated to the real Supreme Court. Now President Donald Trump has picked a nominee to replace Kavanaugh on the second-most-powerful court in the land—and her view of presidential power appears equally expansive. Neomi Rao, a conservative legal scholar currently serving as Trump’s “regulations czar,” has served in all three branches of the federal government, from the Supreme Court where she clerked for Justice Clarence Thomas, to the Senate Judiciary Committee, to George W. Bush’s White House. For conservatives concerned about red tape and unaccountable bureaucracy, she is a godsend. For liberals fearful of presidential power grabs or politics trumping policy in federal agencies, she is a nightmare. Supporters will tout her varied experience as an asset, and current D.C. Circuit judges might cheer her special expertise in the nitty-gritty regulatory issues that come to the circuit, the University of Richmond judiciary scholar Carl Tobias told The Atlantic. Liberals will shudder at her active role in the conservative Federalist Society, where she’s spoken at more than two dozen events in the past decade, and her founding of an academic center at the libertarian-leaning George Mason University supported by a multimillion-dollar donation from the libertarian billionaire Charles Koch. 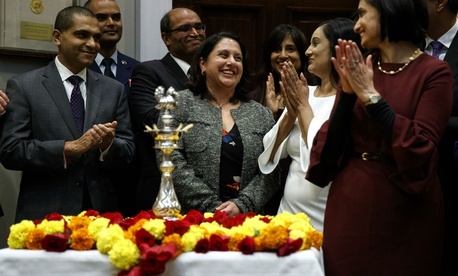 If confirmed, she would be the first Indian American woman to serve on the appeals court. (She has said that her parents, both doctors, emigrated from India in January 1972 and landed in the middle of a Michigan snowstorm.) Trump made a surprise announcement of her nomination recently at a White House ceremony recognizing Diwali, the Hindu festival of lights. “She is going to be fantastic. Great person,” he said. She joined the three dozen judicial nominees awaiting Senate confirmation but now held up by Jeff Flake, the outgoing Arizona Republican, who’s promised to use his Senate Judiciary Committee post to block all nominees until the Senate votes on a bill protecting Special Counsel Robert Mueller. Confirming conservative judges for lifetime federal appointments has been a top priority for Majority Leader Mitch McConnell. Even if Flake persists, he will leave office in January, and a slightly expanded GOP majority could proceed apace. Thanks to a 2013 Democratic decision dubbed the “nuclear option,” judicial nominations need only a simple majority of 51 votes for confirmation, rather than the 60-vote supermajority required during the previous four decades. In addition, Rao would be joining the appeals court likely to hear any constitutional challenge to Mueller’s investigation, says William Araiza, a Brooklyn Law School professor and former clerk for Supreme Court Justice David Souter. Trump might be cheered by her expansive view of presidential power. Araiza says she appears to be a “hard-liner” in favor of the unitary executive theory, a perspective advanced during the Bush presidency that would put many presidential actions beyond the oversight of Congress and the courts. Less splashy but more certain to have consequences is Rao’s view of federal regulations and the president’s authority over independent agencies. In a speech this year at the Heritage Foundation, a conservative Washington think tank, she laid out her vision of a “much smaller and more effective regulatory state.” “Elections should truly have consequences for administration; otherwise, we will have an unconstitutional fourth branch of government,” she said, voicing the conservative fear of an unaccountable bureaucracy burdening citizens and companies with too many rules and regulations. To increase accountability, she previously proposed letting the president fire any independent agency chief at will. Currently, the directors can be removed only for just cause—if they misbehave or break the law, essentially. The Public Company Accounting Oversight Board has expansive powers to regulate accounting firms that audit public companies. Its members are appointed by Securities and Exchange Commission (SEC) and cannot be removed except for ‘good cause.’ The members of the SEC, in turn, may be removed by the President only for ‘good cause.’ The Court ruled that the two-tiered ‘good cause’ protection violates separation of powers principles by depriving the President of sufficient authority to ensure that the laws are faithfully executed by executive branch officials. Rao proposed that the ruling could become the Marbury v. Madison for ending agency independence. In that famous 1803 case, the Supreme Court established the judiciary’s power of judicial review—the right to decide whether a law is constitutional. She says the PCAOB case offers a road map for challenging not just the firing protections of other agency leaders appointed by an overseeing agency, but all leaders of independent agencies. The Constitution vests all executive power in the president, she says, so the president must be able to fire any bureaucratic chief standing in the way of the popularly elected executive. “Changing the removal provisions for these officers really does change how they operate,” says Araiza, the Brooklyn Law School professor. “It makes it more politicized. It makes it less insular, less independent.” Advocates of the unitary executive would cheer the increase in presidential control over the bureaucracy, while believers in federal regulators’ expertise and independence would mourn. If the Supreme Court adopted Rao’s proposal wholesale, the president could presumably fire the Federal Reserve chairman; or the CIA director if the agency was not producing intelligence reports supporting a desired policy, such as invading a certain country; or Equal Employment Opportunity Commission members for moving too slowly to rescind LGBTQ job protections, or the head of the EPA for refusing to reduce regulations on toxic substances or ozone pollution or climate change. If she’s confirmed to the D.C. Circuit, Rao could not suddenly impose her “modest proposal.” But the 45-year-old would likely have decades to work on it.